Deer Antlers. The other day someone asked me, “How in the world did you start selling deer antlers?” They thought the concept was a little odd! She went on her Doberman list and announced that I would be happy to sell and ship deer antlers to all her listmates and their friends. Really. Three hundred plus orders filled my personal e-mail inbox in just a few hours, with more to come. We were in the deer antler business. Soon, deer antlers became a family en-deer-vor. My dad took over the shipping end of the business. Most of the time, Dad is speedy quick and rattlesnake accurate. And when he is not, I just explain to customers that my elderly dear old dad is doing the very best he can with his arthritic fingers—yep, people end up apologizing for even thinking about asking when their order will arrive. Thanks to all of you that have been patient over any snafus…you know we love you best and your little dogs too! If you call us, my mother will answer the phone. My mother considers herself the CEO of Deer Antlers for Pups. Mom does not ship antlers or do any on-line work for the company, but she will answer her phone when you call and promise that I will solve your problem speedy quick or she will go in and poke my dad with a stick to get your order on the road immediately. She also complains loudly when she does not see boxes of antlers sitting by the front door waiting for pick-up by the mail carrier. Our pups and my Camp Run-A-Pup campers test the antlers for quality. My mother’s Doberman, Trinket, is a thief and will make off with a jumbo antler the minute your back is turned. 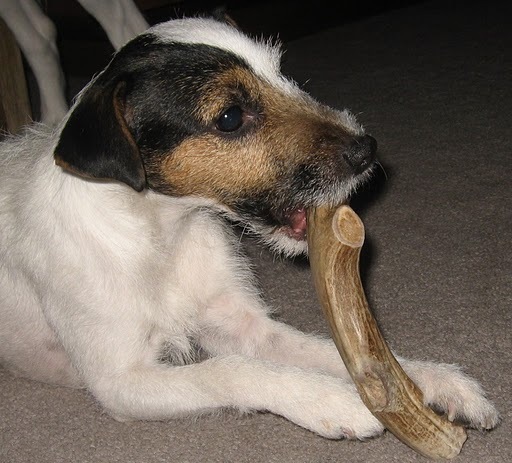 Rascal, my sweet Jack Russell, waits until I pick out an antler for her to test and then properly goes about the job of testing the antler very methodically while Trinket throws her deer antler in the air, slides on it, pokes small children in the eye with it, and then chews it like a dobergartor. Our profits go towards things like my kids’ braces and my mother’s dog show entries. My dad is taken to lunch occasionally—if he keeps shipping costs down. Since we know how expensive life with dogs can be, we have made a conscious choice to keep our prices as low as possible. Thinking back to the original questions—we started selling deer antlers because our own dogs liked them so much. We seldom think of it as a business; more as an extension of our life with dogs. Many of our customers have become deer friends; we love the pictures and stories they send us. We love sharing a product we trust enough to give our own dogs and to the dogs of other people. Antler you glad we had this conversation? Me too! Want to talk more about dogs, antlers, or whatever else wags your tail? Just leave me a comment. Your dad is amazing-he ships super fast. My dog love the antlers and its so nice to deal with such a nice family. Thanks! I will pass along your compliment to my dad! Glad your pups are happy chewers! Great story. Your customer service is great and my dogs love the antlers. Loved the picture of the dobergator. Do you like the picture of the Jack Russell??? We are glad we make you and your pups happy! Marley LOVES her antlers. They last longer than any other dog chew out there. You have a great little business going there! Thank you Teresa Marie–always happy to read happy chew stories. Pats for Miss Marley your moose! The antler business is a great little business. We love our dogs “deerly” and are so happy we finally found a nice, safe, long lasting chew for them. When I see people buying Greenies I want to grab them and say, DON’T DO IT”. I don’t know how the people selling them can live with themselves. We have found greenies to be a choking hazard. A friend lost her dog due to choking on a Greenie. They are also known to causes blockages in certain breeds. Just about anything you else you can give your dog is better than a Greenie in our opinion. Just e-mail be at Katybeth@camprunapup.com and I can give you all the details. Or check our our deer antler site. http://www.deerantlersforpups.com/ for more information on ordering. Next post: April 3, 2011: Tweed Day! Ice Cream Sundae!